For approximately 20 years, the international community has played a mind-numbing game of diplomacy, attempting to bring “peace” to the Israelis and Palestinians. Although that same community largely blames Israel for the failure of the ridiculously named “peace process,” history will judge fairly. That judgment will show that it has been the surrounding Muslim nations, along with a willing international community, that has blocked peace. That same international community is not naïve, nor is it idealistic. There is a more sinister element at play here. We must resolve to pay attention to the steady drumbeat of terrorism aimed at Israel, even in the face of the inane peace process. Only a few days ago, 15 mortar shells and a rocket landed in the western Negev desert. The Israeli Air Force was able to kill five Islamic Jihad terrorists as they were preparing to fire more rockets at the Jewish state. Meanwhile, Palestinian political operatives, including Mahmoud Abbas, condemned a U.S. Senate motion, which highlighted the futility of the one-sided recognition of a Palestinian state, and instead advocating for negotiations. As his operatives were launching rocket and mortar attacks, Abbas was playing the political process. In these acts, they continue the 60-year war against Israel, launching terror while also giving lip service to peace. This one-two punch of psychological attack ensures that the conflict will continue. It is what I call the routine of evil. While the terror war continues apace, Middle East political forces join their international counterparts in shielding the Palestinians from their moral responsibility to stop murdering people. When the rocket hit the Negev on December 21, a young woman sustained slight injuries. It is very clear that the international community does not care about her. They don’t care about kidnapped soldier Gilad Shalit, so why should they care about her? Since Israel launched Operation Cast Lead exactly two years ago, in order to stop rocket attacks, 384 rockets and mortars have still been fired into the country. On December 18, two women were stabbed—one died—by Palestinian terrorists in the city of Beit Shemesh, southwest of Jerusalem. One of the women was approached by the men, one of whom tore off her Christian necklace. The same day, three Palestinians attempted to stab an IDF soldier, who then drew his weapon. This happened in the neighborhood of Givat Ze’ev. Between December 14 and 20, there were three separate stone-throwing incidents, in which Israeli vehicles were targeted. Let me be clear: the people who perpetrate these attacks are barbarians. Because these incidents are not large, full-scale terror activities, they are ignored by the international media. But think about this: imagine that you lived in a country attacked like this every hour of every day, for decades. Would it be a big deal to you? And yet, while this murderous campaign continues unabated, Palestinian terror chieftains push forward their phony political initiatives. Saeb Erekat, head of the PA negotiating team, and a resident of Jericho, has sent a letter to EU foreign minister Catherine Ashton. The letter asks the EU to recognize a Palestinian state within the 1967 borders. The Palestinians are seeking audiences with representatives from the EU nations, Japan, South Korea, Australia, New Zealand, and African countries. The Palestinians, well-versed in Soviet-style propaganda and Marxist ideals, continue their one-two psychological punch of terror and political lies. 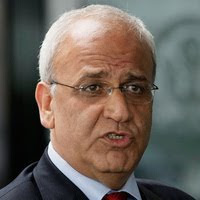 PA Prime Minister Salam Fayyad, recently told Israel’s Channel 2 that the Palestinians do not want to declare unilaterally a state, and that they do not want to resort to violence. He stated that “freedom cannot be realized through violence.” Meanwhile, Ismail Haniya, head of Hamas, said that the terror entity would continue its policy of not recognizing Israel. Hey, Channel 2: stop covering these men. Stop helping them dispense their propaganda. This old Palestinian trick of murdering while denouncing murder is designed to confuse and weaken Israel psychologically. It has proven to be successful, all the more because a watching world is satisfied with watching the routine of evil. More people need to say this: the Palestinians do not deserve a state. They should be held accountable for the murder they practice. In a couple generations, perhaps their radicalization can be reversed. Until then, to the international community: stop enabling these people! Jewish deaths and injuries demand this justice.